The mean time duration for obtaining good ECG signals using the new lead plates was ~10 seconds while the mean duration with the legacy design was ~ 25 seconds. This is a significant reduction in the time required for collecting data, representing markedly improved throughput. Independent observers agreed that the time for data collection and quality of the signals were greatly improved with the new design. As you may know by now, the challenge with obtaining ECG in awake mice has been artifact associated with animal movement. 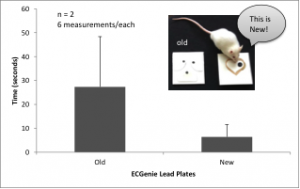 The new lead plate design is much more forgiving to animal movement because the animal is more often in contact with electrodes of the opposite polarity. The great features of the companion EzCG analysis software reveal all of the PQRST morphology of the signals, automatically generating all of the interval durations, ensemble averaged signals, and heart rate variability metrics, in the time and frequency domain. 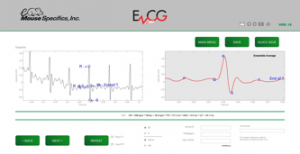 EzCG also automatically generates the power spectra, and heart rate variability tachograms. Q: What do I need to do with my old lead plates? A: Nothing. You can still use them. Q: What happens to old lead plates? A: The old version will be discontinued as of 10/31/16. A: New ECGenie plates may cost slightly more due to the increased amount of conductive material inherent with the new design. However, because the signals appear faster, the lead plates may experience less contamination, increasing their life, effecting a lower net effective price per ECG recorded. Q: Do I have to purchase a new ECGenie for the new lead plates? A: No. New ECGenie plates are compatible to any previous versions of ECGenie. The new lead plates will allow researchers and technicians to non-invasively collect copious amounts of cardiovascular data from awake laboratory mice. The speed and ease with which you can monitor the heart of your mice should significantly increase research productivity and efficiency.